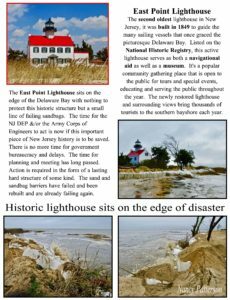 East Point Lighthouse is an active navigational aid built in 1849, situated on the picturesque Southern Bayshore in Cumberland County, New Jersey. 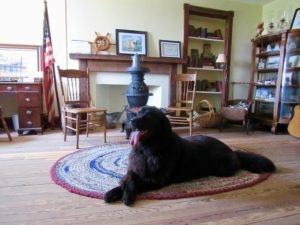 The lighthouse has been fully restored, furnished and is a year round museum open to the public. Both the Lighthouse and grounds are on the National Historic Registry. 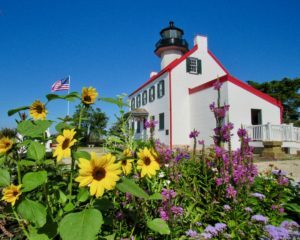 The Lighthouse is the second oldest in New Jersey and the only remaining New Jersey land based lighthouse on the Delaware Bay. 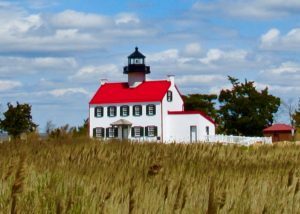 This two story Cape Cod style lighthouse with it’s distinctive red roof by day and blinking red beacon by night, marks the mouth of the Maurice River on the Delaware Bay. East Point is known for it’s spectacular views and sunsets and is a popular destination for artists, photographers, wildlife and history enthusiasts alike.